Volvo Parts > Cooling System > Radiators > 850, S70/V70 93-00, C70 98-04 Manual Petrol Non Turbo do88 Alloy Rad. To Fit: Vehicles with manual gearbox. 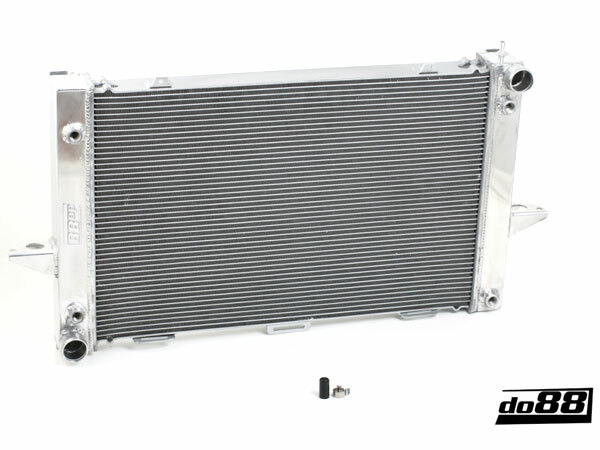 do88 all aluminum performance radiator for Volvo 850 / S70, V70, C70. This radiator fits all models without turbo. All oil cooler connections are left un-used if fitted to a manual gearbox non turbo model. The AC condenser bolts onto this aluminum radiator just as on the standard radiator. Mounting screws, clips and bushings are reused from the OEM radiator. Please note it is very important when installing this radiator to flush the engine completely to clear all old coolant and refil the system ONLY with genuine Volvo coolant (anti Freeze) and distilled water. Failure to do so may invalidate the manufacturers warranty, and lead to premature failure of the aluminium welds. This is because charged particles caused by a mix of coolant types or in tap water can effect the welds of all aluminium radiators over a period of time. Core model: 6mm tube spacing, OEM has 8mm.